Lotteries, raffles and prize draws are some of the most popular types of fundraising, and for good reason - they require a minimal investment from participants (with a sizeable potential windfall) and can be quite profitable for charities and organisations too. Rules and regulations for lotteries are stricter than other fundraising activities; however, do not let that put you off. You can seek advice from your local authority, the Gambling Commission, the Institute of Fundraising, or refer to the Gambling Act 2005 for legislative information. By far the most popular type of lottery is a private lottery. Tickets may only be sold to one group of people, but this type of lottery does not need to be licensed by the Gambling Commission. For example, you can conduct a lottery at work provided you are an employee of that company and you are only selling tickets to work colleagues. The prize draw must also take place within the work setting. Before you can run a lottery, raffle or prize draw, you will need tickets to sell. 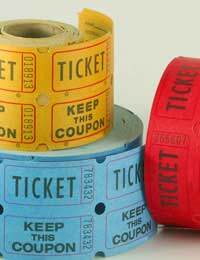 You can purchase books or raffle tickets from print shops or games' retailers, or you can print the tickets yourself using a home computer. Alternatively, you can have tickets printed by a professional printing company, with your charity information included on the ticket. In addition to tickets, you will also need prizes to give away. Whilst it may be tempting to give away cash as a prize (such as a 50/50 draw), there are stricter regulations for cash prizes, so proceed with caution. Although you can buy prizes at retail price, you should also consider asking local businesses to donate items for the lottery. Even if they can't give you an item for free, this will open up the lines of communication and you may be able to purchase the item at a discount, which means more money saved for your charity! Because lottery rules state that, in most cases, you must hold a private lottery, it's a lot easier to sell tickets. Unlike other fundraising activities, you do not have to worry about marketing or promotion, since you can only sell tickets to certain people at work, school or in a club. However, that doesn't mean you should just show up at work with a ticket book and some prizes. Let people know in advance about your fundraising endeavours so they can have money to purchase tickets on the day of the prize draw. This will also create a buzz around your event, and you will also draw in people who normally might not have participated. All that's left once you've gotten prizes and sold tickets is to do the prize draw. You should do this in front of an audience and be clear about the rules that will be followed. For example, you should ask someone who has not purchased a ticket to do the draw, or blindfold a random participant. If you are giving away multiple prizes, be sure to announce which prize is up for grabs before each draw. You don't want your donors to go away disappointed! There are a variety of fundraising activities you can do to raise money for a charitable cause, and a lottery may not seem like the easiest choice. Lotteries are by far the most regulated fundraising activity, and the gambling laws can seem daunting at first. However, once you get started, lotteries, raffles and prize draws are a lot simpler than they first appear. By going through the process step-by-step and seeking guidance when necessary, your lottery will run smoothly. In the process, you'll also be raising lots of funds for your charitable cause! I am part of a ladies dart league and we are holding a raffle on our presentation night. We are using 3 different coloured cloakroom ticket books as raffle tickets. My friend says we need to put each individual colour ticket in a separate bag for drawing. I thought that all tickets regardless of colour should go into the one bag, who is right please. @jo - if you do an online search under 'start a school lottery' there are a couple of organisations that can help give advice.